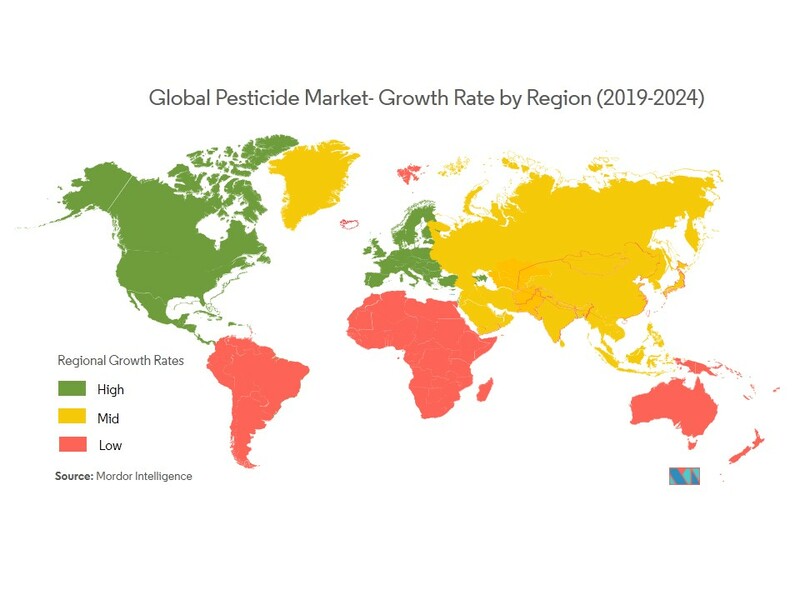 The Global Biopesticides Market was valued at USD 3147.1 million in 2018 and is expected to register a CAGR of 14.1% during the forecast period (2019-2024). The market is segmented by product(bioherbicides, bioinsecticides, biofungicides, others), by formulation ( liquid, dry), by ingredient (microbial pesticide, plant biopesticide, biochemical pesticide) by application (grains & cereals, pulses & oilseeds, fruits & vegetables, commercial crops, turf & ornamentals), and geography. 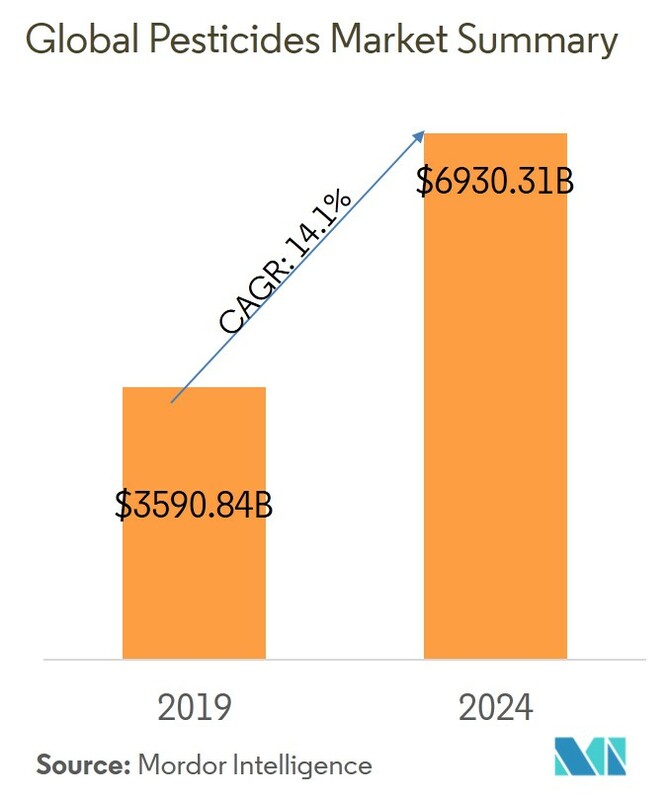 The Global Biopesticides Market was valued at USD 3147.1 million in 2018 and is expected to register a CAGR of 14.1% during the forecast period (2019-2024). Of all the regions, South America is expected to witness the fastest growth in the forecast period, recording a CAGR of 16.4%. In addition, the United States is likely to be the largest individual market over the forecast period. While the prevalence of chemical or synthetic pesticides in crop protection is continuing, human, animal, and environmental health concerns are playing key roles in driving the growth of biopesticides. Several countries are adopting a stringent approach concerning the amount of imports, with a special focus on regulating the quantity of pesticide residues. Emerging economies in Asia-Pacific are likely to take the lead in the adoption of biopesticides. According to EPA, “Biopesticides are certain types of pesticides, derived from such natural materials as animals, plants, bacteria, and certain minerals.” The present study takes into consideration both microbial and organic pesticides. The market is broadly segmented into bioinsecticide, bioherbicide, biofungicide, and others.The report presents a wide-ranging analysis of market share, size, and volume of the biopesticide market on a global scale. The corporations in the biopesticide market operate in B2B, as well as B2C, format. However, to eliminate any “double-count” error in market estimations, bulk buyers procuring these biopesticides for retail sale are, after value-addition through further processing, not considered within the market studied. 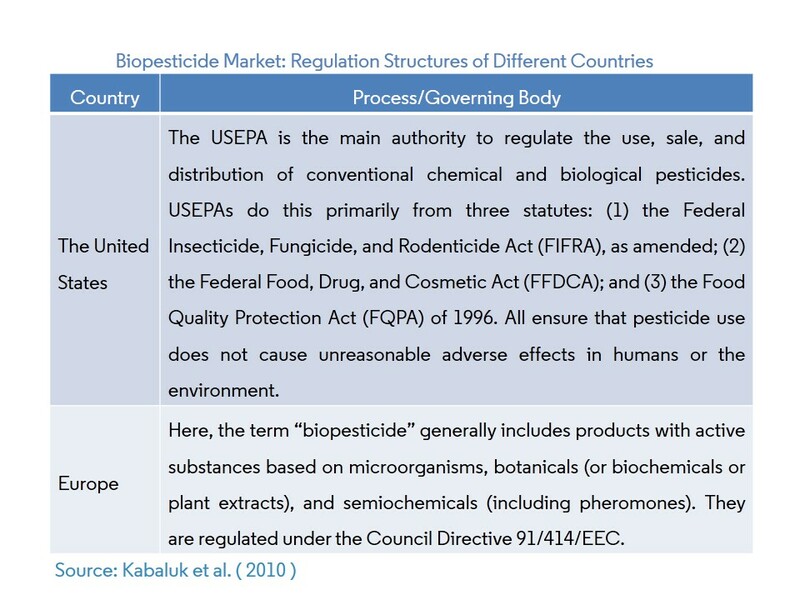 Given that biopesticides tend to pose fewer risks than chemical pesticides, the EPA generally requires less data to register a biopesticide than to register a chemical pesticide. As a result, new biopesticides are often registered in less than a year, compared to an average of more than three years for chemical pesticides.To promote the use of biopesticide, developing countries have simplified the requirement for the registration of biopesticides. These countries are also providing grants for R&D and production unit setups. All these activities are creating an opportunity for the development of the biopesticide market, globally. North America represents around 41.6% of the global market for biopesticides. Demand in the region is driven by a number of factors, including the increased interest in green agricultural practices and the loss of many conventional products to reregistration and/or performance issues. Product development has also driven up the demand for biopesticides. Today more and better biological active ingredients and products are available that can compete with, as well as complement conventional chemical pesticides. In the global biopesticide market, companies are not only competing based on product quality and promotion but are also focused on strategic moves, to hold larger market shares.New product launches, partnerships, and acquisitions are the major strategies adopted by the leading companies in the global biopesticide market.In the market studied, companies not only compete on new product launches but also focus on strategic moves, to acquire larger market shares.The results of the market share analysis indicate a highly fragmented market. The major players include - Valent Biosciences Corporation, Koppert BV, Certis USA LLC, Bayer Cropscience AG, and Syngenta.The major acquisitions taking place between companies to develop biopesticides, indicates that the focus on bio-based products are increasing rapidly. 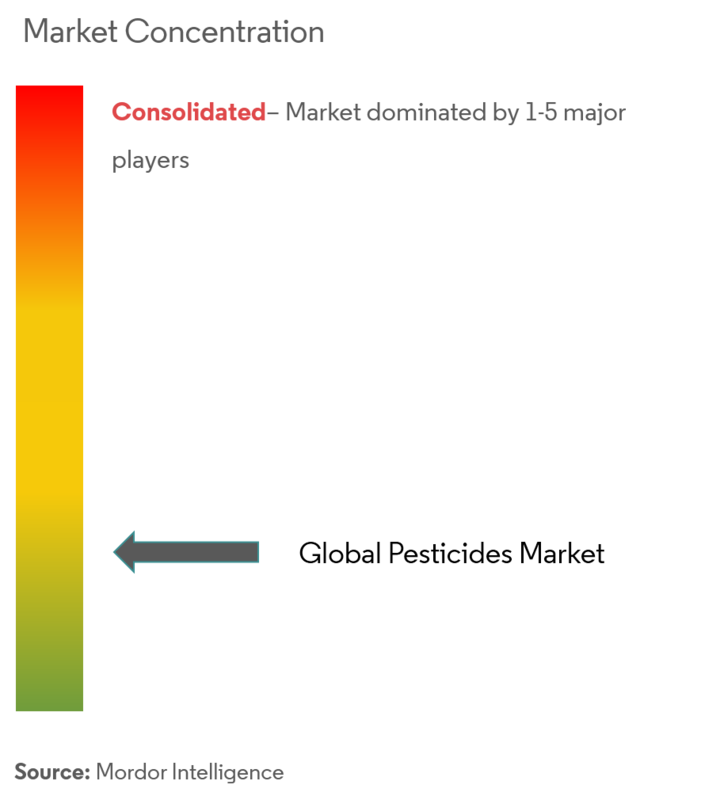 The players in the market are investing heavily in this market, to diversify their biological research divisions in the expanding market place.